Counterparty - What Does It Mean? What is a "counterparty"? What is the definition of a "counterparty"? 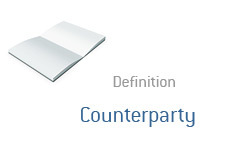 A "counterparty" is the entity (or "party") that is on the opposite side of any financial transaction. For instance - if you buy a house, then the "counterparty" is the person who is selling you that house. For instance - if you buy 1,000 shares of MSFT, then the "counterparty" in that transaction is the person (or company) that is selling you the 1,000 shares of Microsoft. For instance - if you buy 50 December Microsoft call options with a strike price of $25, then the "counterparty" in the transaction is the person who is selling (or writing) the options. For instance - if you purchase a car, then the person who is selling you the car is the "counterparty" in the transaction. As you can see, the term "counterparty" applies to every transaction that involves the purchasing of an asset. In order to purchase an asset, you need somebody to sell you that asset. This person (or company) is the "counterparty". Is Thornburg Mortgage In Danger of Falling into Bankruptcy?